From a collection of wall quote stickers with sweet and loving sayings, a popular phrase that is ideal for placing in your bedroom. 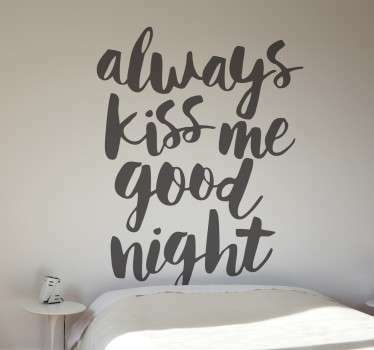 Several ‘always kiss me goodnight’ signs and stickers with different decorative and elegant fonts that you can customise to match the rest of your bedroom decor. 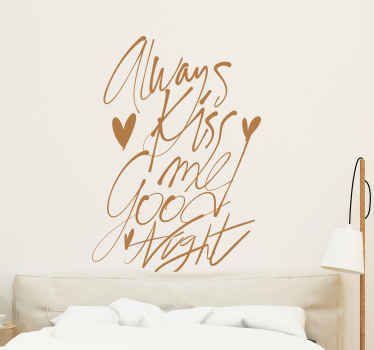 Create a closer bond between you and your partner with help from ‘always kiss me goodnight’ wall art. Choose the size and colour that best suits you and apply easily to any flat surface. Made from high quality and anti-bubble vinyl.